Biopresence is an art venture formed by Shiho Fukuhara and Georg Tremmel with the purpose of exploring, participating and ultimately defining the most relevant playing field of the 21st century: the impact of biotechnologies on society and the human perception of these coming changes. Biopresence creates Human DNA trees by transcoding the essence of a human being within the DNA of a tree in order to create "Living Memorials" or "Transgenic Tombstones". Biopresence is collaborating with scientist and artist Joe Davis on his DNA Manifold algorithm, which allows for the transcoding and entwinement of human and tree DNAs. 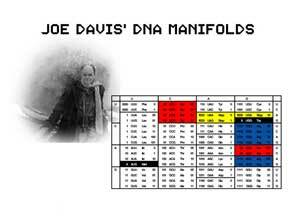 The Manifold method is based on the naturally occurring silent mutations of base triplets, this means it is possible to store information without affecting the genes of the resulting tree. Biopresence Human DNA Trees do not modify the genes of an organism. Therefore, they are not genetically modified organisms (GMOs). Biopresence presents current developments of its research and encourages the public to explore the proposed issues and to envision possible futures. How can this be done? Find out! How is it possible to store information within the DNA of a living organism without changing its genes? Find out!